Featured image: Border wall stretches for miles into the rolling landscape on the outskirts of Nogales, Arizona. This kind of fencing is impassable to most wingless wildlife. Photo by Rebecca Kessler for Mongabay. On Tuesday, a federal judge in California ruled that the U.S. Department of Homeland Security did not abuse its authority in waiving dozens of environmental laws to build sections of wall along the border between the U.S. and Mexico. The ruling frees the department to waive laws for future border wall construction projects. In August and September the department waived more than 30 laws, including key environmental laws, to expedite construction of three border wall projects in California. 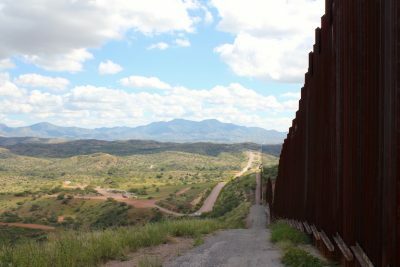 The projects include the construction of eight wall prototypes, now completed, and the replacement of two sections of existing border fencing. Judge Gonzalo Curiel consolidated three separate lawsuits against the Department of Homeland Security that were initially filed by the state of California, a consortium of NGOs (Defenders of Wildlife, the Sierra Club, and the Animal Legal Defense Fund), and the NGO Center for Biological Diversity. The suits contend that the department exceeded the authority Congress granted it, via legislation dating back to 1996, to waive laws for border infrastructure construction, and that it violated environmental laws and the constitution in the process. Judge Curiel’s 101-page ruling on the consolidated cases threw out those arguments, finding that the department’s actions are valid. 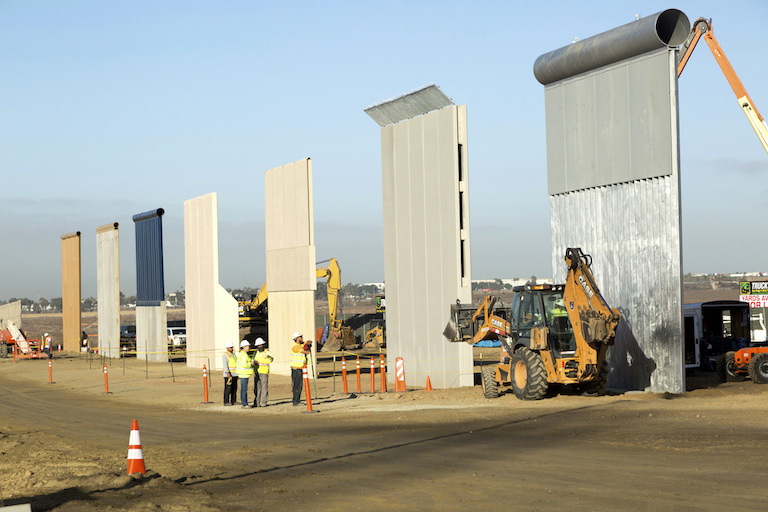 Trump border wall prototypes being built in October, 2017, near the Otay Mesa Port of Entry in San Diego, California. A judge ruled that the U.S. government acted legally in waiving environmental laws to build the prototypes and other wall segments. Photo by Mani Albrecht/U.S. Customs and Border Protection via Flickr. Currently about one-third of the roughly 2,000-mile-long U.S.-Mexico border has fencing. President Trump has pushed to fortify the remainder, saying it is necessary to prevent the flow of drugs and undocumented immigrants over the border. But he has since indicated that he might accept a less complete structure. But the next day he declared that he would delay further wall construction in California until the entire project gains approval. It remains uncertain whether Congress will fund the president’s border wall project. The issue was wrapped up in heated negotiations over broad immigration reforms last month, but the discussions have stalled out after a looming deadline evaporated. Congress now appears to have moved on to other topics. Brian Segee, an attorney for the Center for Biological Diversity, one of the plaintiffs in the case decided this week, said the group plans to appeal the ruling, according to the Los Angeles Times. The President’s border wall proposal has been intensely controversial, with the Mexican government and numerous local governments and civil society groups opposing the wall on practical, humanitarian, and environmental grounds. Conservationists say the existing border infrastructure, most of it erected under former U.S. President George W. Bush, has disrupted ecosystem connectivity and harmed borderland wildlife populations that rely on habitats in both countries. Low barriers that most species can cross well enough traverse about 300 miles of the border. But tall walls that stop all but the smallest non-flying animals in their tracks run along another 405 miles. Conservationists have issued dire warnings about the potential impact of a wall traversing the entire border. Numerous species would be negatively affected, including bison, pronghorn, bighorn sheep, bears, foxes, salamanders, and even certain bird species, they say.